The day starts early, I woke up in my hotel room, eager to reunite with my former coworkers for another VYCC style get together. I walked to the Vermont state house and looked up at the old gold roof and thought about the history of this building, and what it truly stood for. The building is not only a place for all the, crazy politicians to conspire new ideas and laws, but its also a building that represents the United States. This building is a symbol of the free world, of democracy. As I walked through the door, I was greeted by that green VYCC uniform, and immediately, a smile started to conjure and my heart started to beat a little faster. At that point, John and Breck and some other VYCC alums walked in, starting off the day. We sat in the big room, and to be honest the overwhelming sensation of boredom started to descend on me and the other crew members. But, this feeling was over when my name, along with all the other VYCC workers, was called out across the room. The room filled with excitement. Were these people clapping all for us? After lunch, we went to meet governor Phil Scott. We stood in a typical VYCC style circle, and we all talked. I was able to catch a selfie with him before we said our goodbyes. Reflecting back on this, it was one of the coolest things I have ever done, a true once in a life time opportunity that I got to live! All thanks, to the VYCC! 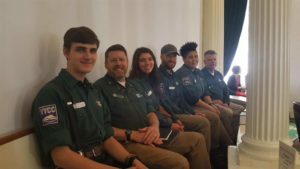 -Evan Coleman, VYCC 2017 Alumni Conservation Crew (pictured at the end of each row of VYCCers in the photos). See photos from the VYCC Statehouse Day. 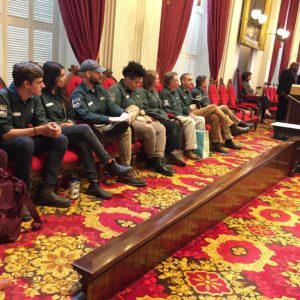 Read the official Vermont state proclamation passed honoring VYCC’s two national awards from the U.S. Forest Service and The Corps Network.